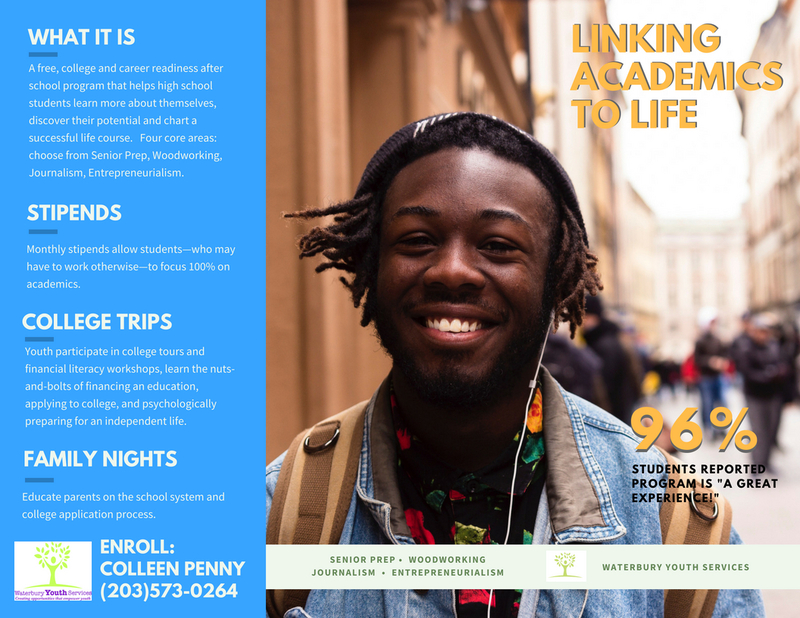 Linking Academics to Life (LAL) is an afterschool program for High School Students that runs Monday-Thursday from 3pm to 5pm during the academic year. LAL consists of some common elements and four unique programs which appeal to students individual interests. Program outcomes reflect increased scores on the Developmental Assets Profile, youth advancing to the next grade level on time, and youth graduating from high school on time. The program is extremely popular with youth and always has a waiting list. A free, college and career readiness afterschool program that helps high school students learn more about themselves, discover their potential and chart a successful life course. Four core areas: choose from Senior Prep, Woodworking, Journalism, Entrepreneurialism. Monthly stipends allow students—who may have to work otherwise—to focus 100% on academics. Youth participate in college tours and financial literacy workshops, learn the nuts and-bolts of financing an education, applying to college, and psychologically preparing for an independent life. All youth participate in a homework session, in which tutors are available to assist students. Youth must attend school daily in order to come to program and they must maintain a C grade point average. If they fall below a C, the program provides individual tutoring in the specific subject area. Educate parents on the school system and college application process. The Entrepreneurial Program (E-Program) is a program that introduces students in grades 9-12 to the world of business and entrepreneurship through both theoretical and practical business applications. Youth develop a variety of competencies throughout the program as they accomplish various tasks including research, developing business plans, creating products, developing marketing plans, brainstorming and implementing their own ideas. The critical thinking skills they develop as they accomplish these tasks will lead them to success in whatever their chosen fields may be. The self-confidence they develop through the experience of success lingers long beyond their participation in the E-Program. The Journalism Program is dedicated to encouraging youth to explore information in the media with sharpened eyes. They examine different perspectives and challenge themselves to look for the truth. The goal is to enhance their ability to gather information and make sense of it all in a way that increases their perception and understanding. Through journalism, youth are able to express their views and develop their opinions in a way that promotes self-reflection and awareness. Through writing, examining others’ writings and speeches, discussions, and activities such as news broadcasting, debates, and interviews they are able to exercise their viewpoints and discover new ones. Our popular Woodworking Program is an amazing hands-on program that develops skills with wood and machinery. Under the tutelage of an expert teacher and woodworker, youth learn how to build unique wooden projects involving planning, cutting, sanding, painting, and sealing. From start to finish, students create wooden toys, coat racks, shelves, stools and paper architecture. While making beautiful wooden articles, youth enhance their math and measurement skills, learn to follow multi-step directions, pay attention to strict safety requirements, appreciate detail, and develop a keen sense of pride and accomplishment. The Senior Prep Program focuses on high school seniors’ success after high school. The program offers educational opportunities as well as job readiness and career skills. Students research various careers, determine what education/training is required and then explore various schools, colleges and universities that provide the desired programs and best match the student’s vision for their future. Students research the qualifications of a successful applicant to the schools they are interested in, the application processes and timelines, and begin to shape their post-graduation plan. Program staff also accompanies students on college tours and assists them with Financial Aid and entrance applications. The program strives to provide seniors with the tools needed to be successful as they transition from high school. Students are encouraged to develop the attitude of an achiever, work towards a successful future, and to accomplish their goals.